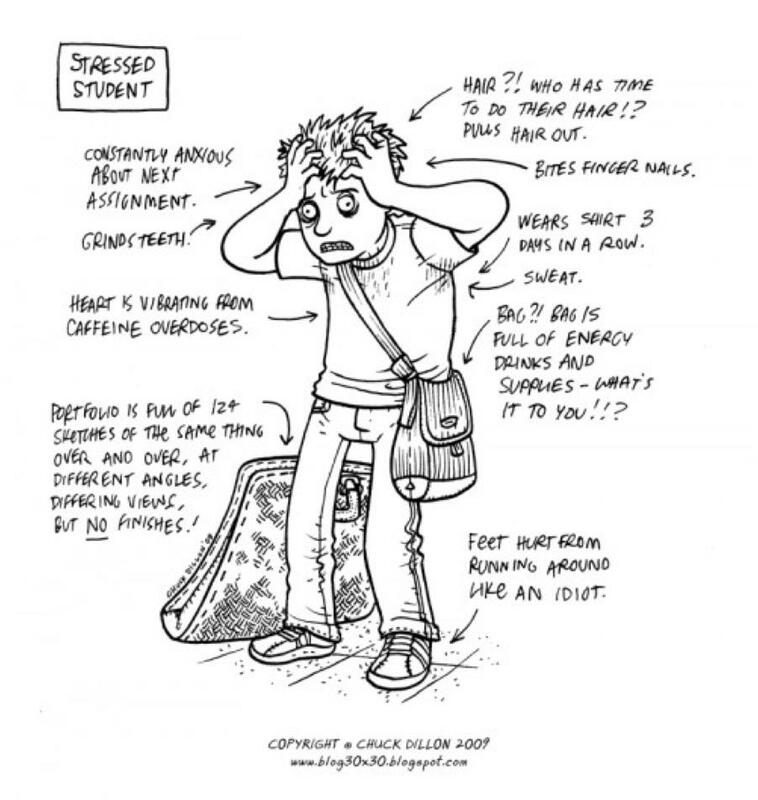 Stress in a student’s life has become a major reason. We all live with stress, the tension we feel when confronted with a new or threatening situation. College students are no different than anyone else, as they too, experience the stresses and strains of living in today’s world. They are constantly facing new situations where the outcome is often uncertain. They may be living on their own for the first time and supporting themselves. Their sense of self-esteem and well-being is challenged by problems and managing time. Without really understanding why, they may become angry or anxious, sad or frustrated. When young adults become overwhelmed by stress, they sometimes withdraw or strike out at others. Parents often feel inadequate in responding to the stress experienced by their children. Stress is not always bad. An appropriate level of stress can effectively motivate student toward growth, achievement, and self-satisfaction. Talk about it. Talking with a trusted adult helps students feel they do not carry the burden of stress alone. Encourage your children to discuss their feelings, but refrain from telling them how they should feel. Ask open-ended questions which require more than a yes or no response. Remember to listen. Teach problem-solving skills and constructive action. Stress is often the result of feeling trapped and overwhelmed by the problems in our lives. Students are sometimes immobilized by their inability to see a positive outcome for a difficult situation. By teaching them to solve problems one step at a time, we provide them with a useful resource to deal with stress. Slow down. The fast pace of our complex lives is often stressful in itself. College students living at home need privacy and quiet time, and unstructured time when they can exercise their imagination and process the events of the day. Set your standards high, but do not expect perfection. One of the most important gifts to give children is a sense of positive self-esteem. Attaining goals contributes significantly to the development of self-esteem. Having the unrealistic expectation that your children should be perfect sets them up to experience stress, self-doubt and failure. Put life into perspective. College students often become obsessed with the present moment. They may feel overwhelmed because they cannot see beyond the immediate problem. They have difficulty identifying options and alternatives. Stress can often be reduced by reminding them that life goes on and tomorrow can be better than today.